In Part 2 of the CEB Sales Roundtable, we discuss how B2B buyers are becoming more complex—and what we need to do to make the sale. The transcript is below or you can listen here. Hey everybody, welcome back. This is Brent Adamson from CEB coming to you from Las Vegas here at the CEB Sales and Marketing Summit. 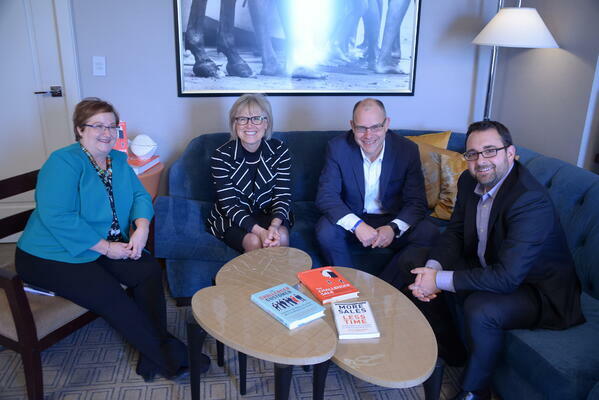 I'm joined by Nick Toman from CEB, the Sales Leadership Council, by Jill Konrath, the author of More Sales Less Time and with Lori Richardson, the CEO of Score More Sales. Today we're talking about complexity. We've spent some time already talking about internal complexity and the impact it's having on the seller's ability to sell. Why don't we shift gears now to talk about external complexity. That is the complexity sales leaders and sales professionals are seeing on the customer side. Lori we'll start with you. What's top of mind for you in terms of when we think about complexity on the customer side, what sales leaders and sales professionals are seeing and how it's impacting their ability to sell? When we're starting with the buyer's journey, that opens things up because a lot of sellers don't know how to do that. They don't know how to add value and how to make good use of the buyer's time. This is a problem for new salespeople, but it's also a tremendous problem for those that have been selling for quite some time because we have to retrain them on what it is that their buyers need to know. Jill, what about you? Again, we're talking about complexity. Is your work more recently focused largely on internal complexity or is it internal and external customers? Is is How do you put those two together in your mind and think about how customer complexity is impacting individual salaries. To me, everything's about the customer. That's why we're here, to serve the customer. Like Lori was just saying, until people really understand who their buyer is and what their needs are, nothing matters. I really, really think that buyer's expectations have changed significantly for salespeople and most salespeople are not prepared to deal with it. Tell me more. Which expectations in particular, you think? The fact that number one, they expect you to add value in every single interaction. Unless you're doing something in every single phone call, email, meeting, anything that you send or do with people or interact with them unless it adds value, you're not worth having in the conversation. I mean you're just not worth being around. Buyers expect you to add value in every single interaction. Knowing that, a salesperson has to be really smart about a lot of things that they've never been smart about. Not just the buyer's journey but the buyer's world, what's happening in their organization, their issues and challenges, what's on their plate? Their priorities, they have to be really cognizant of how things changing in the economy and in their business or even industry are impacting their customer. They have to be able to tailor their messaging and their conversation. They need to tailor it all so it fits and so it ties in exactly with what people are talking about. It really takes a lot of work. A distracted mind is not capable of doing that well. I come back to that over and over. This is why we need to have people being able to focus more during their work day and not bouncing from CRM to email to this and that. They need to be able to focus so that they can research this stuff and learn it and then pull together in a way that their buyer will go, "Oh, this is interesting. This is interesting." In that world that both of you just described, it's all about understanding customers and understanding what they're working on, their priorities, and what they've got to do. In some ways, it's as old as sales itself, but in many ways sales have become significantly more complex. It feels to me that in this world, empathy becomes incredibly important. It's not just your ability to understand your customer at a business level, but to be able to effectively project yourself into their shoes and into their lives and say, "What does it feel like to be in the that environment? What stresses are they facing? What pressures are they under?" It's more of a personal conclusion then one from CEB Research per se, this word "empathy" but I find myself coming back to it more and more often now. I'd love to get your thoughts on this. Is it something that resonates with you Lori as a word on top of mind for you? Yeah, I think it's part of really putting yourself in their world. In order to do that you do need to know how they feel. We know that people buy emotionally and we need to know what their world is like, what their life is like. Not just what our product or service might be able to do for them, but really not to lead the witness so we can find out and learn more about them. What I was thinking when Jill was talking was that's just one buyer. Think about how we also have another 5.8 now to deal with. That's an awful lot of complexity. Yeah and again, they're struggling with complexity too, aren't they? Right, Jill? I'm going to weigh in on this because I have a counterpoint. I would love to hear it, that's why we're here. I just finished reading a study recently from some researchers out of France. It was a sales study on negotiation and the success of negotiations. So three groups in this. Each of these groups had buyers and sellers. In Group One, they were just told, "You go and negotiate a deal. Buyers you know what you want, sellers you know what you're trying to achieve in this deal, go get it." In Group Two, the sellers were told, "We want you to empathize. Empathize and really feel what the buyer is potentially feeling at this moment in time under the auspices of this negotiation and tenseness. We want you to really get in touch with the emotional stuff here." Then Group Three was told, "We want you to sit and think as if you were the buyer - really study and think about what is that person thinking about?" Now, results of the study. Basically, the control group did whatever they normally did. The group that was focused on empathizing did better than the control group, so it did help. The real winner was the ones who were really able to sit and think like the buyer. What are their issues, concerns, roles, responsibilities? What do they have to do to get it all done? What would be a satisfactory conclusion for this negotiation? In this case, 76% of the people in that negotiation felt that both sides were satisfied with the result of the negotiations. It's clear that thinking is crucial. That's a powerful finding. What it means to me personally is that I need to go back to the dictionary and look up the word "empathy" because in my mind in a lot of ways, I think of empathy as not just the emotional component but the cognitive side too but then maybe because I'm mis-defining it. One way or another, I think we'd all agree, it's your ability to place yourself in your customer's shoes and think about the world from their perspective. Nick, obviously we've spent a lot time at CEB studying customer complexity for the better part of three or four years now. What would you pull out as one or two conclusions from that work that really strike you as being top of mind and usually important for leaders? If we think about the customer and this notion of empathy. I think of understanding what customers are going through when they buy something. I would argue not even buy something, just simply make a decision, right? Try sitting on a committee with a bunch of people and try to make a decision today, in today's organizations. You just gave me nightmares. Right. With many different kinds of stakeholders and then where a significant amount of spend might be on the table to buy something. You just wonder how decisions ever get done? In many cases they don't, right? A lot of them just fall off the table. What's interesting I think is dealing with 6.8 different stakeholders representing 3.7 different functions inside the average buying organization, with multiple geographies often times playing a role at this table. The dynamics become overbearing for customers. In many cases, our research shows customers flat-out get overwhelmed with the purchase process themselves. I think as a salesperson, being empathetic towards that notion becomes important. I think also, understanding how can I simplify their lives which in turn simplifies my life as a salesperson? If I can get the buying group to focus in on the core issues to find some degree of overlap in agreement around the true business challenge. Not everybody jockeying for their own personal goals or ambitions within the purchase, but really saying, "Okay, at the core of this, what is the fundamental business issue we're solving? Now what is the fundamental action we need to take to get to that business issue?" What's interesting is, just by simply slowing things down for that buying group, helping them process the information. The competing perspectives, the opinions that this particular group has, the opinions of other vendors who might be part of this consideration, I think we're seeing more and more winning sales behavior based on this ability to slow things down, help the customer process the information, simplify it. What's interesting is as a salesperson, I've stripped out tremendous amounts of noise and variability and all the options and configurations and all the different approvals I might have to go back and get from finance on my own organization or the product teams, right? Can you guys support this? They're asking for this now or that now. If you can slow it down for the customer, it makes it so much easier when you go back inside your own four walls to do your own job. There's this really interesting phenomena here where it kind of goes back to the point we made earlier in the segment here about simplifying things and slowing things down. Those who understand how to do it, do it well. Organizations that are enabling their teams to do it, giving them the permission to do it. Help the customer by slow it down for them. You don't have to say yes to every single request. In fact, try to direct the customer in the direction we think they need to go. It's going to be best for their business. That often time alleviates complexity all around and to me it's just a very interesting phenomena. Stop being so responsive, start being a little bit more prescriptive. Jill you had a thought? What we're talking about here is really a different role for salespeople. We used to say, "What do we have to do and what does this mean?" It's not just simply a function of saying, "Well, slow it down and do this." You have to teach people how to do this differently because now they are change agents in an organization and they are leading a change initiative. This is not something that most people signed up for. And in a sense you're a project manager as well. You're looking at all the moving parts and you're saying, "What do we need to do? Who do we need to call in right now? How can I let this group know that they're on hold? This other group needs to come forward and they haven't been involved." It's a real, very complex project management, change management issue. The change management of bringing in the components where people have different perspectives and how do we get buy-in in an organization that needs what we have but has such vast and competing opinions about what is going to make a successful solution. These are new skill sets that salespeople need to be taught. That they're not taught. It's about leading, about guiding. It's about project management as opposed to selling. You know Jill, I'll never forget. When I was in Chicago about a year ago, there was this Chief Sales Officer there. We were talking about some of these themes. He looked at me and said, "Brent, this doesn't sound like selling. It sounds like marriage counseling." You know what? I told him, I looked at him and said, "You're actually not that far off because in a lot of ways it is that." Let's see if we can bring it back to some real tactical piece of advice. Nick, I'll start with you and then we'll go to Lori. Jill, I'll give you the last word on this. If you were to boil it down when we talk at the organizational level, or at the individual level, wherever you want to jump in. Give us some advice. What's one or two pieces of advice to go do this or stop that, where would start or stop be for you Nick? I think the strongest recommendation I would make at an organizational level is that most organizations have at some level created buying stages to identify the stages with which customers buy. That's not good enough. What I would recommend they do is take each one of these buying stages and determine what is the thing that's most likely to bog the customer down, get in their way, delay their progress, confuse them, overwhelm them, and identify that one thing. There might be three or four, but find the most urgent, important, most commonly occurring thing that will bog them down and help your sales reps understand what to look out for and give them very practical tools. A diagnostic tool,for example, that helps a customer's stakeholders get on the same page or on the problem. Structure a very simple type of working session that the seller might use to go in with that customer and say, "Look, you guys aren't on the same page around these aspects X, Y, and Z. Let's sit down and really think through them." Give them a very tactical guidance to issue to the customer to help the customer get past these complexities of their buying process. Just essentially steer them through the purchase process. If you can map that to the buying process and ultimately to your sales process, suddenly as a seller I know what I'm looking for. I can spot it, I can help course correct very quickly. I think that's probably one of the most practical things that I would urge organizations to do. Find the buying landmine and defuse the buying landmine would be the way to go. Lori, what's your one or two stop, starts? What are tactical advice you might provide? Companies need to have their leaders help the reps focus on what's important. They need to do that through regular coaching. Not when it's convenient, not when you're going to hit your numbers this month, that's not coaching. To help them navigate on what is important and to help them prioritize. If they can do that one thing, they can increase revenues dramatically. That is good advice. Jill I'll give you the last word on this on tactical advice to deal with customer complexities. I honestly believe that the sales is a thinking profession today. What we need to do is to continually up-skill our sales teams. I honestly think that the most important thing we can do is to turn our sales organizations into continual learning organizations. Every time we do something, make it a learning event. We failed, what are we learning? We won, what are we learning? We ran into obstacles, what are we learning? What can we do to get everybody in the organization involved in continuously learning and sharing what they're learning with each other so the whole organization is lifted. That second word is just as important as the first. It's a learning and sharing. What do we collectively know I think is hugely important. What do we collectively know? How can we help each other? How can we all get better together? I totally agree. When you think of winning in this environment, it is in fact it has to be a team sport. Thank you Lori, Jill and Nick for joining us on this discussion about customer complexity. If you missed last week's post listen to Part 1 of our discussion about internal sales complexity. Stay tuned next week for Part 3 of our conversation at CEB.